Palabras clave: Ciencia politica, Historia de la filosofía islámica, Historia del pensamiento económico, Filosofía de la historia, Filosofía comparada, Teología política . Los profundos cambios geopolíticos de las últimas décadas, el papel destabilizador de las “primaveras árabes”, el proceso en curso de reestructuración del Oriente Medio han desviado la atención general hacia el pensamiento político islámico. 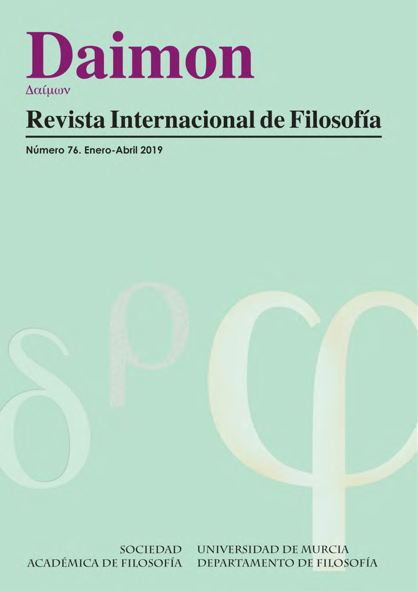 En un contexto de crisis y desorientación, el concepto de la asabiyyah y una lectura contemporánea de la filosofía de Ibn Jaldún son fondamentales en el nombre de una interpretación moderna de la teología política clásica. Giovanni Patriarca (1975) ha estudiado Ciencias Políticas en la Università di Camerino y Filosofía en la Pontificia Universidad Lateranense. Ha obtenido el Diploma de Estudios Islámicos en el Pontificio Instituto de Estudios Árabes e Islámicos-P.I.S.A.I. y el Doctorado en Filosofía en el Pontificio Ateneo Regina Apostolorum de Roma. Ha sido becario del DAAD en la Humboldt Universität de Berlin y ha llevado a cabo diversas investigaciónes en diferentes instituciones académicas internacionales. Ganó el premio Novak en 2012. Ahmad, I.A. (1996), “Islam and Markets”, Religion & Liberty, vol. 6-n.3. Alatas, S.F. (2006a), “A Khaldunian Exemplar for Historical Sociology for the South”, Current Sociology, vol. 54, no. 3. Alatas, S.F. (2006b), “Religion and Reform. Two Examples for Autonomous Sociology in the Non-Western Context”, en S. Patel (ed. ), The ISA Handbook of Diverse Sociological Traditions, SAGE Studies in International Sociology, London. Al-Azmeh, A. (2003), Ibn Khaldun. An Essay in Reinterpretation, Central European University Press, Budapest. Al-Matroudi, A.H.I. (2006), The Hanbali School of Law and Ibn Taymiyya. Conflict or Concilliation, Routledge, New York. Andic, F. M. -Andic, S. (1985), “An Exploration into Fiscal Sociology: Ibn Khaldun, Schumpeter, and Public Choice”, FinanzArchiv / Public Finance Analysis, New Series, Bd. 43, H. 3. Asante, M. K. (2011), “De-Westernizing Communication. Strategies for Neutralizing Cultural Myths” en G. Wang (ed. ), De-Westernizing Communication Research. Altering Questions and Changing Frameworks, Routledge, New York. Ashtor, E. (1977), “The Development of Prices in Medieval Near East”, en B. Spuler (ed. ), Geschichte der islamischen Länder. Wirtschaftsgeschichte des Vorderen Orients in islamischer Zeit, Band 6 — Teil I, E. J. Brill, Leiden. L. M. Ashworth (2007), “Ibn Khaldun and the Origins of the State Politics”, in Persram N. (ed.) (2007), Postcolonialism and Political Theory, Lexington Books, Plymouth. Baali, F. (1988), Society, State and Urbanism. Ibn Khaldun’s Sociological Thought, State University of New York Press, Albany. Baeck, L. (1994), The Mediterranean Tradition in Economic Thought, Routledge, London. Black, A. (2001) The History of Islamic Political Thought: From the Prophet to the Present, Routledge, New York. Bonner, M. (2006), Jihad in Islamic History. Doctrine and Practice, Princeton University Press, Princeton. Bori, C. (2003), Ibn Taymiyya. Una vita esemplare. Analisi delle fonti classiche della sua biografia, Istituti Editoriali e Poligrafici Internazionali, Bari. Boulakia, J.D. (1971), “Ibn Khaldun. A Fourteenth Century Economist.”, Journal of Political Economy 79, n. 5. Böwering, G., Crone, P. & Mirza, M. (eds.) (2013), The Princeton Encyclopedia of Islamic Political Thought, Princeton University Press, Princeton. Browers, M. (2006), Democracy and Civil Society in Arab Political Thought: Transcultural Possibilities, Syracuse University Press, Syracuse. Butterworth, C. (1990), “Al-Fārābī’s Statecraft: War and the Well-Ordered Regime.” en J. Turner Johnson- J. Kelsay (eds. ), Cross, Crescent, and Sword: The Justification and Limitation of War in Western and Islamic Tradition, Greenwood Press, New York. Campanini, M. (ed.) (2005), Studies on Ibn Khaldun, Polimetrica, Monza. Carré, O. (2004), Le Nationalisme arabe, édition Payot, Paris. Cavarero, A. (1995), Corpo in figure. Filosofia e politica della corporeità, Feltrinelli, Milano. Choueiri, Y.M. (2010), Islamic Foundamentalism. The Story of Islamist Movements, Continuum International Publishing, London. Colosio, S. (1914), “Contribution à l’etude d’Ibn Khaldun”, Revue du Monde Musulman, XXVI. Cook, D. (2002), Studies in Muslim Apocalyptic, The Darwin Press, Princeton N.J.
Corbin, H. (2000), Historia de la filosofía islámica, Editorial Trotta, Madrid. Crone, P. (2005), Medieval Islamic Political Thought, Edinburgh University Press, Edinburgh. Cruz Hernández, M. (1996), Historia del pensamiento en el mundo islámico, Vol. 3, Alianza Editorial, Madrid. El-Fadl, K.A. (2001), Rebellion and Violence in Islamic Law, Cambridge University Press, Cambridge. Fischel, W. J. (1967), Ibn Khaldun in Egypt. His Public Functions and His Historical Research, University of California Press, Berkeley. Fraihat, I. (2016), Unfinished Revolutions. Yemen, Libya, and Tunisia after the Arab Spring, Yale University Press, New Haven. Fromherz, A.J. (2010), Ibn Khaldun. Life and Times, Edinburgh University Press, Edinburgh. Gabrieli, F. (1930), “Il concetto della ‘asabiyyah nel pensiero storico di Ibn Haldûn”, Atti della Reale Accademia delle Scienze di Torino. Classe di Scienze morali, storiche e filologiche, LXV. García Lizana, A. (2006), “Tradición y Progreso: Las claves del futuro”, Cuadernos de CC.EE. y EE. (Universidad de Málaga) , n. 50-51. Gellner, E. (1995), Muslim Society, Cambridge University Press, Cambridge. Gierer, A. (2001), “Ibn Khaldun on Solidarity - Modern Science on Cooperativeness and Empathy: A Comparison”, Philosophia Naturalis, n. 38. Grutzpalk, J. (2007), “Umma und Asabiya: ein muslemisches Gegenkonzept zu „Gemeinschaft und Gesellschaft“ oder eine mögliche Ergänzung der Tönnieschen „Grundbegriffe der reinen Soziologie”, Tönnies Forum-Rundbrief der Ferdinand Tönnies-Gesellschaft, v. 16/1. Gwartney, J. -Stroup, R.- Sobel, R. -Macpherson, D. (2008), Macroeconomics: Public and Private Choice, Cengage Learning, Boston. Haddad, B. - Bsheer, R. -Abu Rish, Z. (2012), The Dawn of the Arab Springs: End of an Old Order?, Pluto Press, London. Hashemi, N. (2009), Islam, Secularism, and Liberal Democracy: Toward a Democratic Theory for Muslim Societies, Oxford University Press, Oxford. Hefner, R. W. (2011), Shariʻa Politics: Islamic Law and Society in the Modern World, Indiana University Press, Bloomington, IN. Hentati, N. (2007), Les écoles juridiques en Afrique du Nord. De l´origine au V°-XI° siècle, (ed. par C. Intartaglia), Etudes Arabes n.100-101, PISAI-Pontificio Istituto di Studi Arabi e di Islamistica, Roma. Ibn Khaldun (1993), The Muquaddima: An Introdction to History, (trans. F. Rosenthal) Princeton University Press, Princeton. Ibn Taymiyya (1993), Against the Greek Logicians, (edited and translated by W.B. Hallaq), Clarendon Press, London. Ibraham, H. (1988), “Leisure, Idleness and Ibn Khaldun”, Leisure Studies, vol. 7, Issue 1. Iskauskaite, R. (2012), “The Complexity of the Concept of Islamic Revivalism and Revivalists’ Understanding of a Proper Model of State”, Politologija, no. 2 (66), pp. 105-146. Jan-e-Alam Khaki (2013), “Muslim vs Islamic”, [sitio en internet] www.dawn.com , 18 May 2013. Katsiaficas, G. (1999) “Ibn Khaldun: A Dialectical Philosopher for the 21st Century”, New Political Sciences, vol. 21 n.1. Khan, A. (2006), “Islam as Intellectual Property: “My Lord! Increase me in Knowledge.” en H. M. Ramadan, Understanding Islamic Law: From Classical to Contemporary, AltaMira- Rowman&Littlefeld, Oxford. Kirmanj, S. (2008) ,“The Relationship between Traditional and Contemporary Islamist Political Thought”, Middle East Review of International Affairs, no. 12 (1). Krawietz, B. (2003), “Ibn Taymiyya, Vater des islamischen Fundamentalismus? Zur westlichen Rezeption eines mittelalterlichen Schariatsgelehrten”, in M. Atienza (Hrsg), Theorie des Rechts in der Gesellschaft, Duncker&Humblot, Berlin. Kurzman, C. (2012), «The Arab Spring Uncoiled», Mobilization: An International Quarterly, vol. 17, no. 4, pp. 377-390. Lacoste, Y. (1984), Ibn Khaldun. The Birth of History and the Past of the Third World, Verso Editions, London. Lambton, A.K.S. (1981), State and Government in Medieval Islam, Oxford University Press, Oxford. Lane, J-E. - Redissi, H. (2009), Religion and Politics: Islam and Muslim Civilization, Ashgate Publishing, Farnham. Laoust, H. (1939), Essai sur les doctrines sociales et politiques d´Ibn Taymiyya, Institut Français d’Archéologie Orientale, Cairo. Lav, D. (2012), Radical Islam and the Revival of Medieval Theology, Cambridge University Press, Cambridge. Luhmann, N. (2007), La sociedad de la sociedad, Editorial Herder-Universidad Iberoamericana, México D.F. Mabrouk, M. (2011), “A Revolution for Dignity and Freedom: Preliminary Observations on the Social and Cultural Background to the Tunisian Revolution”, Journal of North African Studies, vol. 16, issue 4, pp. 625-635. Makdisi, G. (1983), L’Islam hanbalisant, Geuthner, Paris. Marmura, M.E. (2005), “Medieval Islamic Philosophy and the Classic Tradition”, en J. Inglis (ed. ), Medieval Philosophy and the Classical Tradition: In Islam, Judaism and Christianity, Routledge, New York. Martos Quesada, J. (2006), “Islam y ciencia en Al-Andalus”, ´Ilu. Revista de Ciencias de las Religiones, Anejo XVI. Métraux, G.S. (ed.) (1977), Pensée et valeurs de l’Islam, Cultures, Vol. IV n.1, Les Presses de l’Unesco et la Balconnière, Paris. Mona, H. (2010), “Modern Interpretations and Misinterpretations of a Medieval Scholar: Apprehending the Political Thought of Ibn Taymiyya”, en Y. Rappaport (ed. ), Ibn Taymiyya and his Times, Oxford University Press, Oxford. Montgomery Watt, W. (2009) Islamic Philosophy and Theology, Aldine Transaction, Pescataway-N.J. 2009. Morris, J. W. (2009), “An Arab Machiavelli? Rhetoric, Philosophy and Politics in Ibn Khaldun’s Critique of Sufism”, Harvard Middle Eastern and Islamic Review, n. 8. Nasser, N. (1997), La pensée réaliste d´Ibn Khaldun, Presse Universitaire de France, Paris. Noja, S. (1997), Breve storia dei popoli dell’Islam, A. Mondadori, Milano. Olsson S.- Kersten C. (2016), Alternative Islamic Discourses and Religious Authority Contemporary Thought in the Islamic World, Routledge, New York. Patriarca, G. (2013a), “A Medieval Approach to Social Sciences. The Philosphy of Ibn Khaldun. Some Historical Notes and Actual Reflections”, en S. Alvi- A. Al-Roubaie (eds. ), Islamic Economics. Critical Concepts in Economics, Vol. I, Part IV, n. 21. Routledge, New York. Patriarca, G. (2013b), “Il caleidoscopio dell’assabyia: analisi, rischi e prospettive. L’attualità di Ibn Khaldun in un contesto di crisi”, Studia Politica — Romanian Political Science Review, vol. XIII, n. 3. Patriarca, G. (2011), “Die Rückkehr der Assabiya”, [sitio en internet] Al-Sharq, disponible en www.alsharq.de/2011/hintergrund/die-ruckkehr-der-assabiya- , acceso el 27 de mayo de 2011. Riedel, M. (1975), Metaphysik und Metapolitik. Studien zu Aristoteles und zur politischen Sprache der neuzeitlichen Philosophie, Suhrkamp, Frankfurt. Rosenthal, F. (1932), Ibn Khalduns Gedanken über den Staat, R. Oldenbourg, München. Rosenthal, E.I.J. (1958), Political Thought in Medieval Islam: An Introductory Outline, Cambridge University Press, Cambridge. Said, E. W. (1978), Orientalism. Western Conceptions of the Orient, Pantheon Books, New York. Sival, E. (1990), Radical Islam: Medieval Theology and Modern Politics, Yale University Press, New Haven. Suurland, D.A.J. (2009), “Totalitarianism and Radical Islamic Ideologies”, en B.C. Labuschagne & R.W. Sonnenschmidt, Religion, Politics and Law. Philosophical Reflections on the Sources of Normative Order in Society, Brill, Leiden. Taji-Farouki , S. (ed.) (2006), Modern Muslim Intellectuals and the Qur´an, Oxford University Press, Oxford. Tausch, A. -Heshmati, A. (2009), Asabiyya: Re-interpreting Value Change in Globalized Societies, Discussion Paper n. 4459, IZA, Bonn. Vivanco Saavedra, L. I. (2000), “Características esenciales del pensamiento historiográfico de Ibn Jaldún”, Opción. Revista de ciencias humanas y sociales, Año 16, n. 31. Weber, M. (1904), Die Objektivität sozialwissenschaftlicher und sozialpolitischer Erkenntnis, J.C.B. Mohr, Tübingen. Winkel, E. (1995), “Review of History of Islamic Philosophy by H. Corbin”, Journal of Islamic Studies, n. 6. Zelkina, A. (2011) “Book Review: Global Salafism. Islam’s New Religious Movement”, Religion, State and Society, vol. 39, Issue 2-3.